Is It Too Late to Buy Twilio After Its 120% Rally in 2018? The cloud services provider crushed the market over the past year. Last year, I sold my shares of Twilio (NYSE:TWLO) in the high $20s for a small profit. 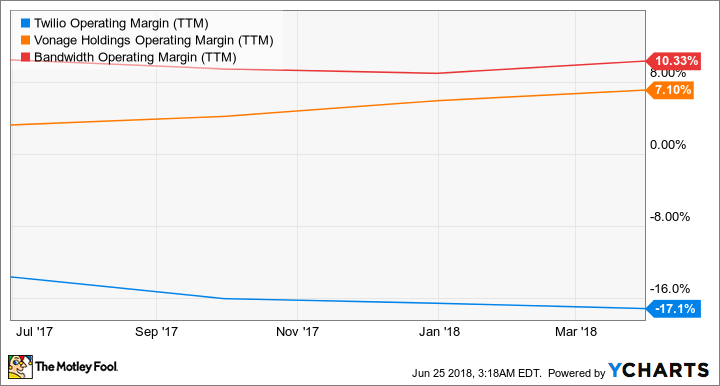 At the time, I thought Twilio's decelerating sales growth, lack of profitability, loss of major customers like Uber, and hungry rivals like Vonage Holdings' (NYSE:VG) Nexmo would crush the stock. It turned out I was dead wrong, and Twilio now trades in the mid-$50s. I'm kicking myself for missing that rally, but I also believe in taking second chances on missed opportunities. So today, let's take a fresh look at Twilio to see if the stock still has room to run. Twilio's core cloud service lets developers integrate voice calls, text messages, videos, and other features into their apps with simple APIs (application programming interfaces). In the past, developers created these features on their own -- often a costly, buggy, and time-consuming task. Twilio simplified the process by hosting those services on the cloud and offering them as paid services, which could be easily scaled up for millions of users. Many large tech companies, including Facebook and Airbnb, outsourced those services to Twilio. Data source: Twilio quarterly reports. However, a gradual deceleration in Twilio's sales growth attracted the bears -- who were finally scared off by its surprising acceleration during the first quarter. That acceleration is partly based on seasonal factors. For the current quarter, Twilio expects its revenue to rise 35% to 37% annually -- but that still exceeds analyst expectations for 28% growth. For the full year, Twilio expects 35% to 36% growth, marking a slowdown from 44% growth in 2017 but also beating expectations for 28% growth. Its closest rivals, Vonage and Bandwidth (NASDAQ:BAND), are expected to post just 3% and 19% sales growth this year, respectively. Twilio's accelerating base revenue growth indicates that it's become less dependent on big non-base "variable" customers like Facebook's WhatsApp, which aren't obligated to pay Twilio minimum revenues. Meanwhile, Twilio's accelerating dollar-based net expansion rate indicates that it's growing its revenues per customer by up-selling and cross-selling new services -- which could lock them into its ecosystem over the long term. Twilio's top line growth is impressive, but it still doesn't have a clear path toward profitability. Its non-GAAP (generally accepted accounting principles) operating loss widened from $3.7 million a year ago to $4.7 million, as its GAAP operating loss widened from $14.8 million to $24.3 million. Twilio's non-GAAP net loss stayed flat year over year at $0.04 per share last quarter (although its share count rose by 7%), but its GAAP net loss widened from $0.16 to $0.25 per share. It expects to post a non-GAAP net loss between $0.05 and $0.06 this quarter, which matches analyst estimates. For the full year, it expects a non-GAAP net loss of $0.07 to $0.10 per share -- which beats expectations for a $0.12 loss. Twilio's growth remains strong, but the stock's 130% rally this year lifted its valuations to uncomfortable levels. At $55, Twilio trades at about 10 times this year's sales. Vonage and Bandwidth trade at about 3 and 4 times this year's sales, respectively. Those numbers indicate that Twilio's stock is getting pricey relative to its growth potential and its industry peers. That high valuation, along with its lack of profitability, indicates that the risks outweigh the potential rewards at these levels. I regret missing Twilio's year-long rally -- but I'd wait for a pullback before buying the stock again.